Last week, ECAL Convenor Jan-Aage Torp visited Bulgaria for four days as the guest of Sofia apostolic leader Krassimir Partovsky. Their investigative mission together was to find out if Bulgaria has the potential of an apostolic movement. The answer seems clear! Bulgaria has a population of just over seven million in a land size of 1/3 of Norway. 85 percent are Bulgarians, nine percent are Turks, and five percent are Rom. The nation has a proud history since 681 AD, and after the transition from communism in 1990, Bulgaria has developed into a functioning democracy. After joining NATO in 2004 and the EU in 2007, Bulgaria has encountered financial challenges, in line with the problems of the Western world. So much so, in fact, that Eurostat last year published a report (covering 2008 to 2011) stating that almost half of the Bulgarians (49.1%) risk falling into poverty or social exclusion. But the nation has invested in the fastest and most stable internet connection in the Western world, and the infrastructure is vastly improved since the days of communism. Sofia, which is the 15th largest city in the European Union with 1,3 million inhabitants, is a city that oozes class, vibrance and initiative. - Welcome to Bulgaria, exclaim Krassimir & Maria Partovsky, the apostle-pastor leaders of the El Shaddai Church, a denominational structure with seven local churches in all regions of Bulgaria. They received me at the beautiful new airport terminal of Sofia and installed me at the downtown Ganesha Hotel, owned by a Bulgarian «spiritual man» who seeks into hinduism. - I can stay there, I chuckled. - I am an apostle, remember?! We are not afraid of hinduism! We have authority in Jesus! The Partovsky´s enthusiastically agreed with me. Krassimir (39) was born again more than 20 years ago, and almost immediately entered the ministry. He has been through it all: The unbelievable charismatic growth of the early 1990´s that followed the downfall of communism; the crackdown on free churches by old communist «hawks» in the latter 1990´s; the struggle to find direction in the years following 2000. - Maria and I are simple people, we just serve God with all that we have, says Krassimir. - We serve the people. Although we are Bulgarians, we love to be with the Rom population as well. Our nation is united, whether we are Bulgarians, Turks or Rom! - That is a proud part of our history! say Maria and Krassimir. - Unlike some other Nazi Germany allies or German-occupied countries (excluding Denmark and Finland), Bulgaria managed to save its entire 48,000-strong Jewish population during World War II from deportation to concentration camps! say the Partovsky´s. 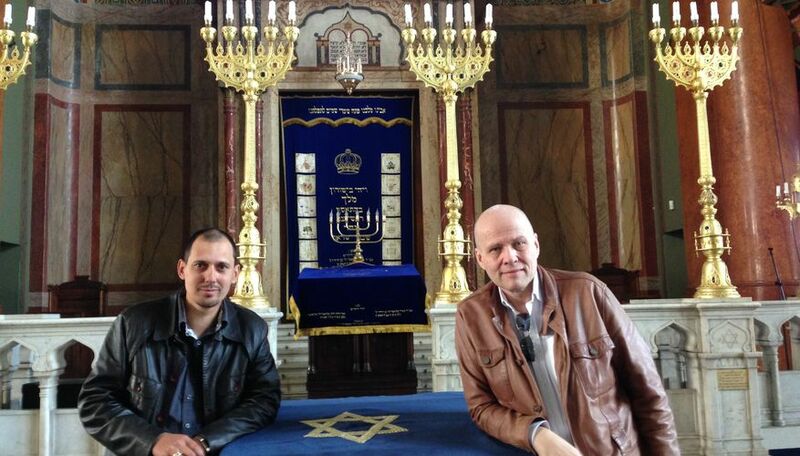 - And to this day we have a beautiful synagogue in downtown Sofia that is open to the public. We are proud of our Jewish population. Bulgaria is a friend of Israel! And every year our churches help the Jewish community in Bulgaria to commemorate their survival in Bulgaria during the last world war. The Partovsky´s took me to meet many apostolic leaders in Bulgaria during my four days there. Apostles Ivo & Ganka Goychev in Stara Zagora are proud Rom Bulgarians and have the most beautiful evangelical church building in the nation, being able to accommodate 1000 people. Pastor Nikola Dimitrov of Burgas is building a new church in his city. Apostle Angel Pilev in Sofia leads an expansive Foursquare church, and has recently (2012) written a book that exposed the corruption of evangelical leaders in the communist era, and this has lasted until now. - A shameful part of our heritage which we now must deal with! Angel said emphatically to me. Pastor and marketplace leader Rumen Olimpiev who has had to deal with financial corruption in the evangelical churches of Bulgaria. And Pastor Stoya Georgiev of the reknown Breakthrough Church in Sofia that is going through significant changes. I ministered in churches and meetings during my four days in Bulgaria. I fell in love with the members of El Shaddai Church in Sofia. But perhaps what impacted me the most was the time Krassimir & Maria and I spent in the simple home of a Rom deacon in the village of Vakerel. The quality of life was undaunted by the poverty around them. There was a tenacity and vision in their lives that will lead to transformation of a family, village and people group. And even of a whole nation! Maria & Krassimir Partovsky enjoy life together! Niki (3) is a Rom boy with a bright future! Krassimir Partovski´s mother and grandmother (88)!